I am a designer, amateur baker, foodie, garden enthusiast, wife and mommy. I’ve been sewing, gardening and cooking since I was a little girl. On my website you can shop for handcrafted artisan gifts for the kitchen and home. All while keeping up with my Kittson's Custom Cakes on my blog. 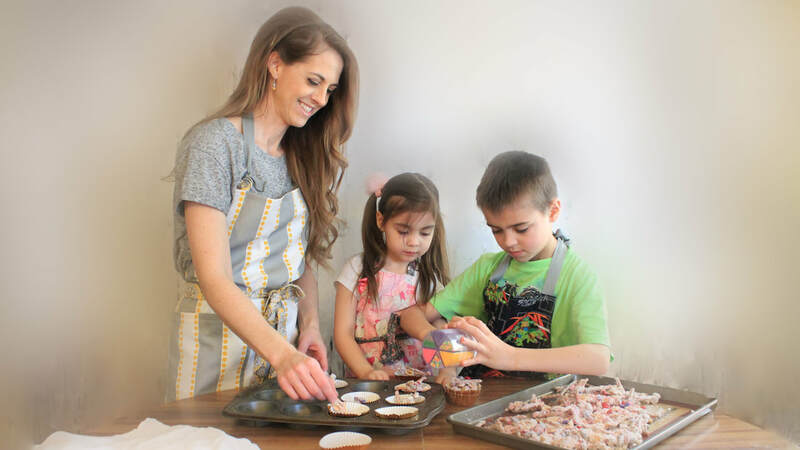 Try some of our favorite recipes that my husband and I test out on our family, or see what Mother Nature allows me and the kids to grow in my garden this season. Being a mother of two keeps me busy in itself - from learning the latest in the video game world and swimming in the creek with my son - to playing Princess dress up and baking cookies with my baby girl. One of my passions is to create fresh, fashionable and functional aprons inspired by my hobbies of cooking, hosting dinners and gardening. Along with my online store, I enjoy setting up shop at farmers markets and craft shows throughout the year. My Modern Vintage Style Apron was created out of my want of a unique classy apron to wear while hosting dinner parties. The style is vintage inspired with a gathered bodice, ruffled bottom and large ties to make beautiful bow. It’s so fun to search for beautiful modern print fabric to make this style of apron. New meets old, hence, the Modern Vintage Apron. During a bountiful season of gardening, I designed a harvest apron to gather my veggies to haul in the house. My harvest aprons have a full apron with elastic pouch and ties that criss-cross in the back for comfort. This is a must have for every gardener. My Egg Aprons are my best seller. They are perfect for the people who have backyard chickens to gather eggs. The elastic pouch holds up to 24 eggs. These are perfect to tie around the waist to keep your hands free - also great for gardening, crafting or farmers markets. My goal as mother is to teach my kids how to grow their own food and cook it, the way I was taught being raised on my family farm in Northwest Kansas. I feel very strongly about kids knowing where their food comes from and appreciate the hard work that goes into putting food on the table for every meal. This is a continual work in progress. The best part about gardening with my kids is to hear them squeal when they find a worm! Check out all the places Kittson's Kitchen has been featured.